Summary: Janice Y. K. Lee’s New York Times bestselling debut, The Piano Teacher, was called “immensely satisfying” by People, “intensely readable” by O, The Oprah Magazine, and “a rare and exquisite story” by Elizabeth Gilbert. Now, in her long-awaited new novel, Lee explores with devastating poignancy the emotions, identities, and relationships of three very different American women living in the same small expat community in Hong Kong. I sure hope I have THE PIANO TEACHER by Janice Y.K. Lee around here somewhere because I was extremely impressed with her latest novel THE EXPATRIATES. This story about three women who live in the same expat community in Hong Kong was marvelous. The writing was beautiful and the characters were rich and complex. It was truly a special read! 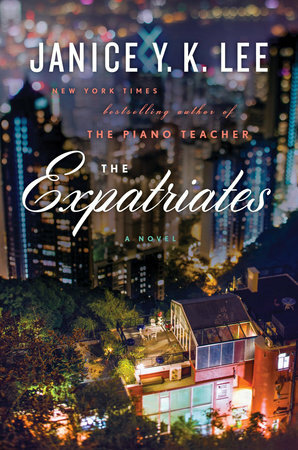 THE EXPATRIATES tells the story of Mercy, a 20-something Korean American who recently graduated from Columbia and moved to Hong Kong to for a change. She is wracked with guilt by an incident that occurred not too long ago, and it's affected her ability to live her life. Margaret, a wife and mother of three children, is also plagued by a horrific loss; and so far, she's unable to get past it. And finally, there's Hilary, a wealthy homemaker who is desperate to have a baby and, hopefully, save her marriage. Each of these three women has their own set of baggage which is causing a tremendous amount of discontent in their lives; and for much of the novel, their stories are their own. However, when their lives do cross (or maybe I should say collide? ), there are interesting effects on all of them. Where do I even begin? I adored THE EXPATRIATES! First of all, I loved these three characters that Ms. Lee created. I should probably clarify that statement by saying that I don't know if I really "loved" any of them, but I did appreciate how well developed they were. All of these women were extremely complex and also so very real to me. Ms. Lee definitely has a special ability to tell stories about women and get into this reader's heart. Another wonderful thing about this novel was how well the author brought the expat community in Hong Kong to life. These women were very drastically different, yet they all lived in the same few miles of the city. Their day-to-day lives didn't bring them together; however, the community was such a small one that it was almost as if everyone there was connected in some way. Ms. Lee did a great with the details of Hong Kong and especially what it would be like for an American to live and operate in this unique community. And finally, I just adored Ms. Lee's writing. Her prose and descriptions were gorgeous; however, it was the messages that she conveyed through these three characters that really stood out to me. The description of these three women, with all of their pain, makes the book sound horribly depressing. And I will admit that these women's plights were difficult to read at times. However, the novel did a terrific job of showing the strength and resilience of women as well as the challenges of being a mother and making a life in a new place. Of course, I'm going to tell you that THE EXPATRIATES would make a great book club selection... especially for groups made up entirely of women. The characters are so complex that you could discuss them and their relationships for some time. There is a reading guide available with fifteen questions that will also help stimulate your discussion. Some of the topics you might want to explore include life as an expat, friendship, marriage, motherhood, guilt, loss, forgiveness, and second chances. I adored THE EXPATRIATES and highly recommend it to fans of women's fiction! Giveaway alert: I have a copy of THE EXPATRIATES to share with one lucky reader. To enter, just fill out the form below before February 16th at 11:59 p.m. EST. I will randomly select and notify the winner the following day. This contest is open to those of you with U.S. addresses only. Good luck! I've never been to Hong Kong but I do know what it feels like to be an expat and it sounds like Lee nailed that. This sounds like one outstanding book! Thanks for the giveaway! I liked her other bok and have been meaning to read this. It sounds like a must-read! Thanks for the chance to win a copy.